Included is a themed medal, water, fruit & mince pies! Each kilometre is accurately marked out with distance flags and we have plenty of helpers to keep you on track and to encourage you on your way to the finish. Come and enjoy the day with us; we hope to see you there! Please be aware that we have a lead bike on the front of each race. In the event that the course is a multi lap course, be aware that the lead bike might catch up behind you, and will be communicating which side the bike will be passing. In the interest of safety to yourself, other runners, pedestrians and our marshals, it is very important that instructions are listened to, and that if you are wearing headphones, your music is at a level that will allow you to hear instructions clearly. Also, please be aware that there will be spectators and members of the public using the park. From Bow Road: Turn right out of the station. Take the next left down Addington Road. Continue walking straight until you can turn right onto Tredegar Road. Take the third left onto Parnell Road – you can enter the park at the end of Parnell Road. It is around a 15-20 minute walk. Alternatively you can take bus 488 or 276 from Bow Bus Garage. From Mile End station: Turn left and cross over Mile End Road. Turn right onto Grove Road – it’s about 20 minutes walk straight down. Alternatively, you can also walk most of the way through Mile End Park, which runs parallel to Grove Road. You will first arrive at the Crown Gates. Alternatively, on Grove Road you can catch bus 277 or 425 to the middle of the park. From Hackney Wick station: Turn left out of the station, at the end of the road turn left onto Wallis Road. Follow Wallis Road, at the T-junction, use the footbridge to cross the A12. 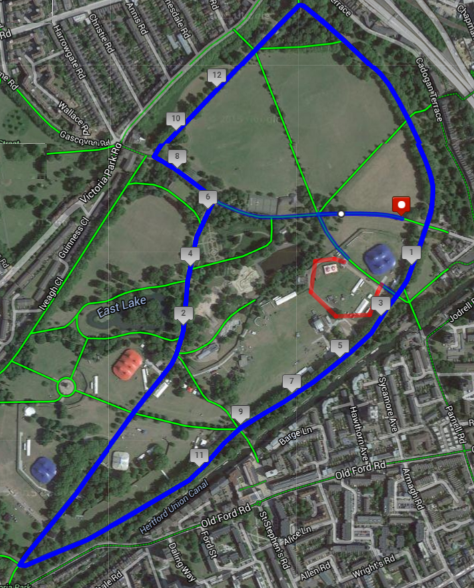 As you enter the park, turn left onto Cadogan Terrace and continue walking until you see the race start area. The park is easily accessible by both foot and cycle. Cycle parking is available in the park. Don't forget to bring something warm to wear afterwards! In terms of spectating, this park couldn't be any better, the fields are open and every area of the park is accessible to see people running round. We are always looking for an extra pair of hands and would love for you to come along and help us – in return we are happy to offer you a free entry into one of our races! Head over to https://www.runthrough.co.uk/volunteer-form/ to sign up! We will have a secure area where you can leave your baggage. We recommend you bring as little baggage as possible. Your baggage tag is attached to your race number, you simply tear it off and attach to your bag. To collect, show your number to the baggage tent staff and they will help you find your baggage. There will be portaloos for all runners a little walk from the Start/Finish so we recommend you take this into account and plan before the race starts. Results will be available on www.runthrough.co.uk after the race. Are running buggy’s allowed for the 5k? Hi there, you are welcome to run with a buggy :) the organiser has asked that runners with buggy's stick to the back at the start of the race in order to avoid congestion. Hope you enjoy the event! Starting and finishing in the centre of Media City you will head out around a 2.5km loop that runs over the canal and runs past the imperial war museum along with the ITV and BBC television studios.